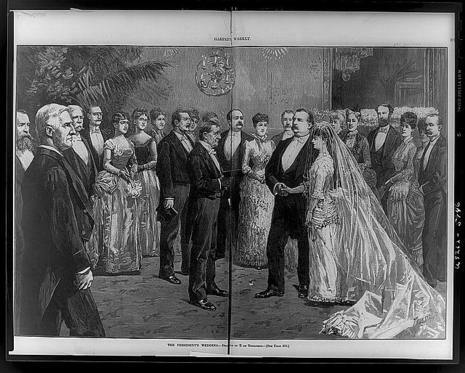 President Grover Cleveland wed Frances Folsom in a White House ceremony on June 2, 1886. Daughter of Cleveland's late law partner, the bride was twenty-seven years younger than her husband. The self-educated Cleveland came from a poor family. After reading law and clerking at a Buffalo, New York law firm, he was admitted to the bar in 1859. 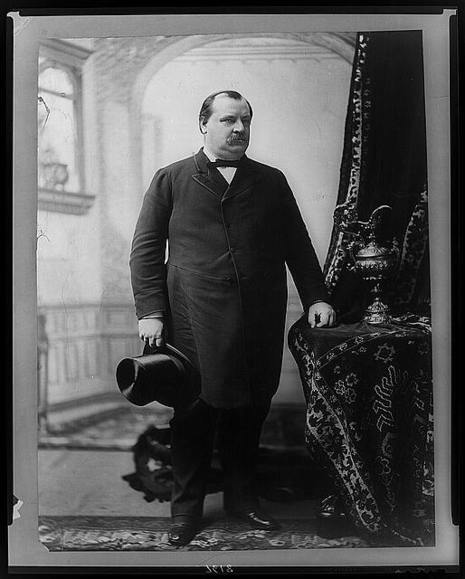 A Democrat, he entered Buffalo's political arena in 1862 and was elected mayor in 1881 and governor of New York State in 1882. 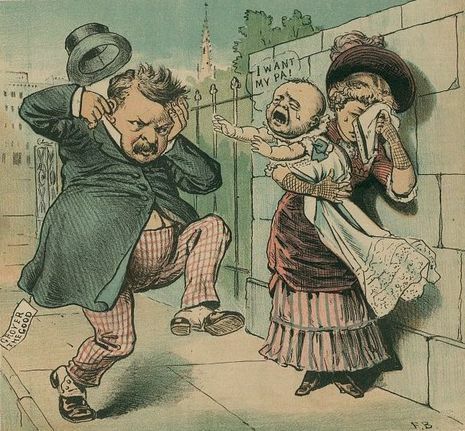 As governor, his opposition to patronage raised his national standing, even as it rankled New York City's Democratic machine. Cleveland entered the White house as a bachelor, but did not remain one for long. In 1885, the daughter of Cleveland's friend Oscar Folsom visited him in Washington. Frances Folsom was a student at Wells College, and when she returned to school Cleveland received her mother's permission to correspond with her. They were soon engaged to be married. On June 2, 1886, Cleveland married Frances in the Blue Room in the White House. He was the second President to marry while in office, and the only President to have a wedding in the White House. This marriage was unusual because Cleveland was the executor of Oscar Folsom's estate and had supervised Frances' upbringing, but the public did not, in general, take exception to the match. At twenty-one years old, Frances was the youngest First Lady in American history, but the public soon warmed to her beauty and warm personality. The Clevelands had five children: Ruth (1891–1904); Esther (1893–1980); Marion (1895–1977); Richard Folsom (1897–1974); and Francis Grover (1903–1995). The British philosopher Philippa Foot was their granddaughter.